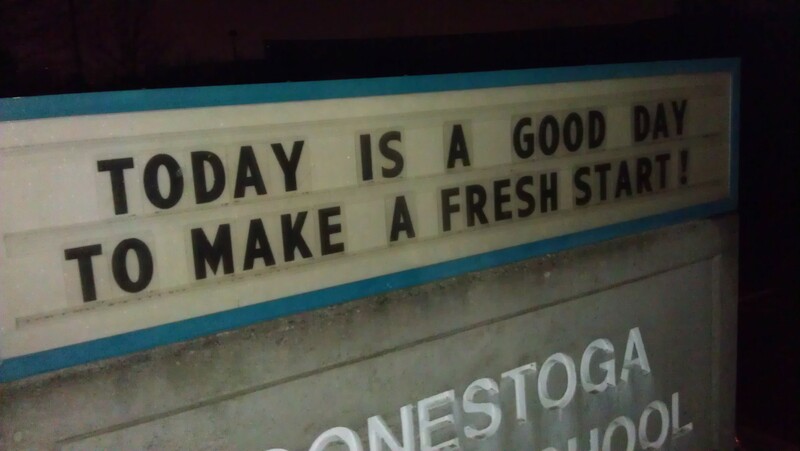 I took it upon myself to change the reader board at my daughter’s school tonight. When the kids come streaming back into class tomorrow, all will assuredly be dragging their feet. A few will be glad, and many will be sad that winter break is over. But for a few, and I hope just a few, it will be a day of dread. Their grades might be bad, their home life might be hard, or they may be down on themselves. So I posted a message on the reader board, just for this one day, with the hopes that at least one of those struggling kids reads it and might be subtly persuaded to give school another try, to at least try to start over. I’ll never know if that message will be received, but it’s worth a shot. Perhaps, just this one day, we can all send a subtle, positive message to someone who is struggling. Or, even an overt one. Today’s gift of time … Changed the reader board at my daughter’s school. Hopefully, a subtle and positive message will get through. This entry was posted in In the community and tagged Back To School, being positive, Giving Our Time, giving time, helping others, Helping Out, Inspiration, Making A Difference, messages, Needs Of Others. Bookmark the permalink.